There are no editorial review yet. AV Tube is a free video downloader that can download video from many popular video websites. It is remarkable for its simplicity and user-friendly interface. Initially intended as a YouTube downloader, AV Tube is being developed continuously and can now download clips from Metacafe and other websites as well. 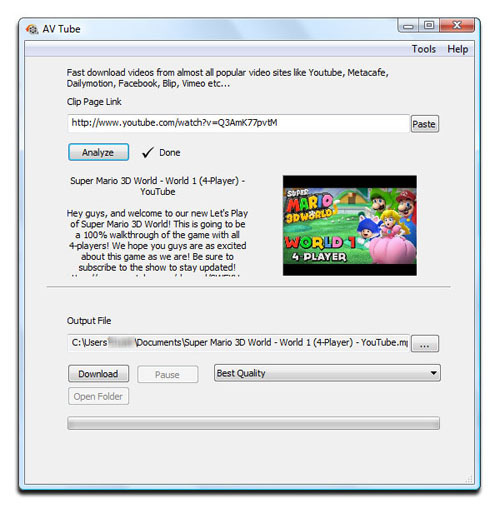 Enables you to get YouTube video clips to your local computer so that you can play them in your iPod, iPad, iPhone, MP4-plyaer, Zune devices, without an Internet connection. Download videos from many different websites with ease. Easily see the list of available source of video to download. Easily preview video quality in details to choose the best quality in need. Download HD videos or the best available quality videos.